Google has been working with machine learning for quite some time and it will be an understatement to call its endeavours impressive. The tech giant has integrated machine learning in lots of its services while launching new services like Google Lens that work entirely on machine learning abilities. Today, the company has taken Google Sheets under its machine learning wings. Spreadsheets are one powerful tool to help users, but users need to the right formulas to get it working to the fullest. And not all users are accustomed to these formulas, which is why Google has now made it easier to pick the correct formula by employing machine learning to suggest formulas based on the data. Besides, Pivot Tables on Sheet are also getting integrated with machine learning tools. Now, one simple click can create a pivot table based on the data, and this will save a lot of time. In the Explore pane, you can also ask questions of your data using everyday language (via natural language processing) and have the answer returned as a pivot table. For example, type “what is the sum of revenue by salesperson?” or “how much revenue does each product category generate?” and Sheets can help you find the right pivot table analysis. 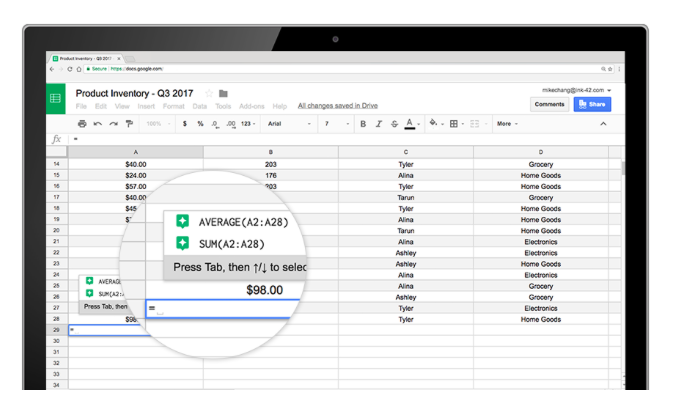 In addition to new machine learning tools, Google is also adding a slew of new features and introducing some changes to make spreadsheets better for data analysis. Google will roll them out in the coming weeks. Check out a refreshed UI for pivot tables in Sheets. We’ve also added new, customizable headings for rows and columns. View your data differently with new pivot table features. Now, when you create a pivot table, you can “show values as a % of totals” to see summarized values as a fraction of grand totals. Once you have a table, you can right-click on a cell to “view details” or even combine pivot table groups to aggregate data the way you need it. We’ve also added new format options, like repeated row labels, to give you more fine-tuned control of how to present your summarized data. Quickly import or paste fixed-width formatted data files. Now, Sheets will automatically split up the data into columns for you without needing a delimiter such as commas between data.